Calling all saxophonists! It’s time to get into the blues. This video is all about playing the blues on saxophone. We’re going to talk about something that always gets neglected when talking about improvising in the blues, or really any style. If you feel like something important might be missing when you’re improvising, this is the lesson for you. 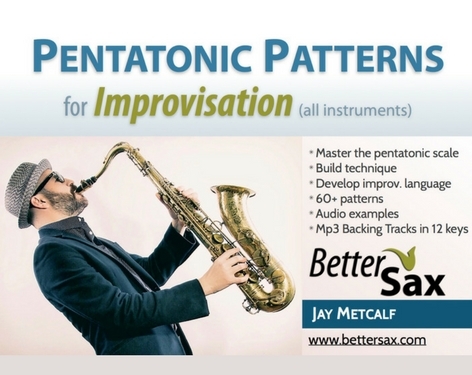 In this video, Jay gives you lesson in improvisation you can practice. If you follow this link you can download the backing track and PDF guide to give the improv lesson a try yourself. Once you have a chance to check that out, head on back over here, and don’t forget to comment and let us know how it went! Every student I’ve ever had try this feels an instant improvement in their overall playing and improvising. Most of the time when sax players think about improvising, we start talking about the notes. We talk about what notes to play and where, and when you get more advanced, we talk about which more interesting notes you can play. The result is what I call notiness or saxophone players playing notily, too many notes. I hear it all the time and I’ve been guilty of it myself far more than I care to admit. It seems like we’re always searching for a super hip note to play in the right spot that will make everything sound better, or trying to stuff too many notes in a small space, thinking that’s going to make it sound better. Unfortunately, this often has the opposite effect — it sounds worse. There probably are two main reasons for this phenomenon. The sax players we love to listen to often play a lot of notes really fast and it sounds great. We want to play like them! Trying to play just like our favorite soloists appears on the surface to be the hardest thing to learn and the biggest challenge to sounding good. We end up spending the bulk of our practice time trying to learn how to play fast at the expense of other techniques that are actually more important. The result is notiness, too many notes. If we go back to our favorite saxophone players who play a lot of notes really fast and listen carefully, we’ll learn something important. The truth is, it’s not the amount of notes that they’re playing or the speed or the hipness of the notes that they put here and there that make them sound great. Although, all those things definitely do help. The thing that makes them sound great is the rhythm of what they’re playing. You don’t need to play a lot of notes really fast to sound good. But, the notes you play have to be in time to sound good. 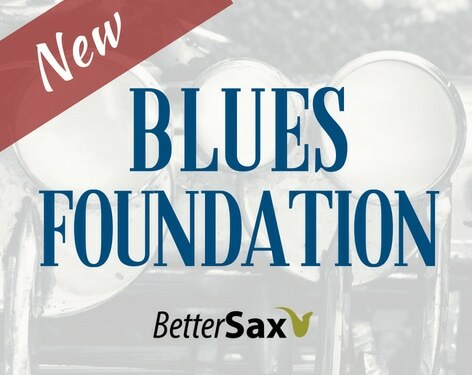 In the new Blues Foundation course, you’ll learn blues tunes and how to improvise solos over the blues entirely by ear. This removes the biggest roadblock to playing rhythmically and in time. I find that students who are relying on reading while learning how to improvise are putting way more importance on the notes themselves and very little importance on the rhythms. Now, unless you are a very strong reader at a professional level, you’re probably not going to be able to read the rhythms and syncopations that are in jazz and blues music in a convincing way. However, if you learn all of this stuff by ear, your chances of success go way up. Let’s make one thing really clear: Rhythm is more important than notes. That fact can be obscured when you hear great saxophone players playing a lot of flashy notes. But if you listen carefully, you’ll notice the rhythm is always there. It’s always the rhythm that carries the music and is the most important element. So why are we always talking about what notes to play? Today, let’s do this differently. We’ll improvise over a backing track that’s part of the Blues Foundation course, and can be downloaded for free here. Your challenge is to improvise while playing only things that are rhythmic, that are in time, that groove with the music and are in the pocket. I want you to limit yourself to the notes you are allowed to play. So, take only the notes from the blues scale, for example. Or only the notes from the minor pentatonic scale, or even fewer notes if you want. Remember, this exercise is not about notes. It’s about rhythm, your rhythm. If you don’t yet know your blues or pentatonic scale, that’s all in the free download to go along with this lesson. 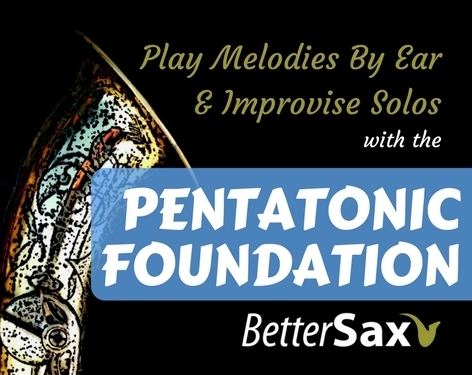 You can also check out our beginner improvisation video here for a few additional tips. For this exercise, you’re going to want to use a lot of space. You don’t want to play any more than 50-50 ratio of notes to space. The space will allow you to hear the rhythm you want to play next. The space will allow you to listen to what you just played and form a coherent reply to that. The space will also help you physically execute the rhythms and notes more accurately on the instrument. The space is your friend! The easiest thing you can do to cure notiness and to sound better right away is to play fewer notes. Get in the habit of using space every time you improvise. For this challenge, you can even use one single note if you choose. In fact, everyone at every level should practice this exercise with just one note. You need to be able to play rhythmically, in the pocket and with the grooves on one note before you can start playing loads of different notes. If you’re not able to do that, then you need to go back to the drawing board and focus on your rhythm. Using the downloadable backing track and PDF guide for this lesson, see Jay demonstrate what it would be like to practice this, using only notes from the minor pentatonic scale. Don’t be afraid to take breaks in between phrases. Give yourself the space to hear and think about what you’re playing. Don’t forget to try this exercise on only one note with rhythms! In my head I’m thinking of the other notes, but I’m just playing the rhythms. If you do that enough, when you start adding other notes, your rhythm is going to be there. Practice this exercise on your own along with the backing track and PDF guide. Remember, notiness is always lurking around the corner. Don’t let it creep into your playing while you’re practicing, otherwise it’s sure to dominate everything you do when you’re performing. Over time, when you get in the habit of playing rhythmically first and notily second, you’ll be able to play faster passages with more notes and they’ll sound good because they’ll be rhythmically in time and they’ll be separated by spaces. So, it’ll make everything a lot more coherent. If you like what you learned in this lesson, we have much more for you to practice with our new Blues Foundation course. Not only will you continue to learn how to improvise with rhythm and space, you’ll also get more comfortable playing by ear and get to know the form and style of the blues. With the Blues Foundation course, you’ll get 30 video lessons, 36 blues backing tracks in all 12 keys and four styles, a PDF course guide, and audio examples of everything you’ll learn. It’s the most valuable way to jump start your blues skills. If you’re ready to get started, you can enroll here. If you’re ready to get into the blues, but are just starting out, we have what you need too. 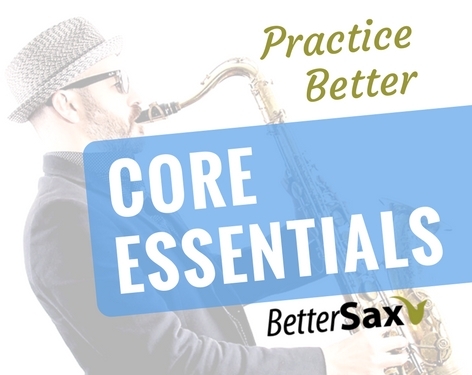 If you’re a beginner, start with our free Play Sax By Ear Crash Course. This will give you a solid foundation to build on. From there, check out the Pentatonic Foundation course, which will help you learn the minor pentatonic scale Jay used for his blues lesson here. Let us know how your blues practicing is going by commenting below! Just remember: rhythm is more important than notes! How do I improve hearing myself in a loud blues band? Usually I’m miked and have a monitor but it’s still difficult. I’m thinking about using my own amp on stage and not worrying about the house system. I use it on all my gigs even when I have a monitor.